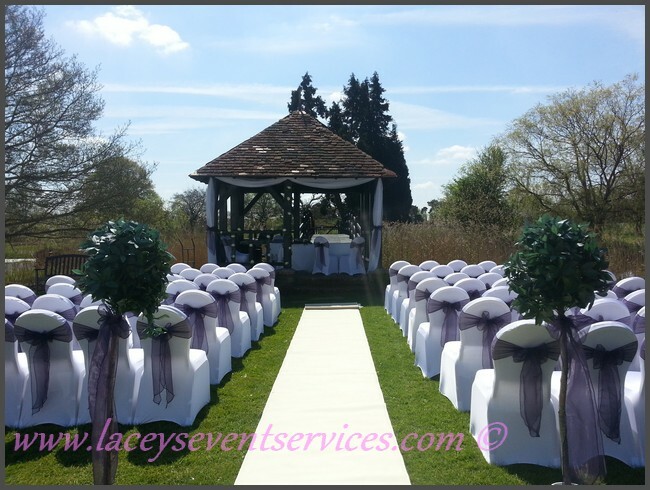 Add an elegant arrival to your Red carpet Event or Wedding day by including a runner and rope barriers! 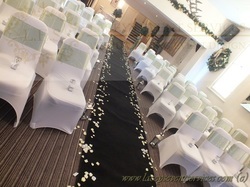 Or our quality woven carpet wedding aisle making a beautiful path to lead you to the altar ~ A great way to protect the bridal gown from dragging on the floor and getting dirty! For a touch of instant romance flower petals can be gently sprinkled to create a lovely flower path. We provide Event carpet Runners & Aisle Runners in cream, red and black, or our use once rayon runners for clients with a tight budget. ​Available in White or Ivory. This item is purchased as it is a use only once product. Aisle Runner is made from top quality, non woven Rayon Fabric. We stock White Carpet Aisle Runners suitable for Indoor and Outdoor Use and are available in many different lengths and widths! 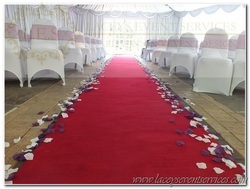 Our red carpet is great for Red Carpet Events, Awards Evenings, Corporate party Entrance and even wedding aisles! ​Rope Barriers are available to hire alongside our Red carpets. Our Black Carpet Aisle runner is made from real carpet and has woven edges for a professional finish and a non slip backing.